Believe it or not, STAR VOICE OF INDIA (VOI) is one of it's own kind. We're addicted to Indian Idol but if i've to admit, i'd say VOI is the best and singers are damn genuine than Indian Idol's. If we listen to singers from both programs, judge them and make a decision, then we'd definitely vote for VOI. I've been watching VOI since it's early few first shows. Their stage was not bright enough initially but as episodes ended one after another, their stages were made more vibrant,funky and lively. Singers are very talented but the songs they sing, at times, are not so good or not upto their standard. Once, i heard Toshi(a singer in VOI) singing something like "dard-e-disco, blah blah.. newyork, san francisco, dard-e-disco".. i was nearly dead hearing that lyrics and laughed on and on intermittently . I tried to find who the hell wrote that lyrics and which hindi movie it belonged to. I was astonished to find out that Sharukh Khan was acting on that song with his six packs shown on it. and the writer of lyrics was none other than Javed Akhtar. Once, i got a message in this very blog of mine that 'every piece penned down by Javed Akhtar is masterpiece.'. He/she wrote me that comment when i criticized Javed Akhtar's behaviour to contestants in Indian Idol. And, looking at the lyrics like 'dard-e-disco' , i must think was Javed Sahab having marijuana? Whatever, past is passe. If i look closely these contenstants of STAR VOI, i think there is strong chance for Harshit to become a winner but i don't know somewhere i think he's a replica of Kumar Sanu. Kumar Sanu who is now making his career in South India and singing for non-hindi indian movies. But, bollywood needs singer like Harshit. My vote is for Harshit. And, if i had to vote for another person, it'd be none other than Irfan. This slim-thin guy is stunning performer. Very beautiful voice. I won't blame anyone if any of these two become the winner. But, there are other contestants like ABHAS,ABHILASHA,ISHMIT,TOSHI. They are tough to get pass through. 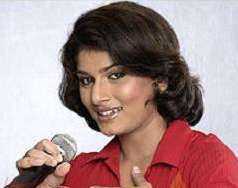 PRIYANI was one of my favourite singer in VOI. She was out of the show yesterday. Her voice was very peppy, unique and chilling but still i feel she's not strong deserving candidate for VOI. I know you are getting lots of offer for movies and teleserials and if you act in any movie, i'm sure, i'll be your first-day-first-show viewer. Haha I don't like that Dard-e-disco song either. that guy is harshit, i was writing about.